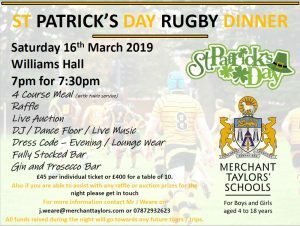 Don’t forget to book your tickets for our annual Rugby Dinner, taking place at 7pm on Saturday 16th March 2019 at Merchant Taylors’ Boys’ School. It is set to be a great evening consisting of raffles, actions, live music and a four course meal. Tickets are £45 per individual or £400 for a table of 10. All funds raised will go towards sports tours/trips.